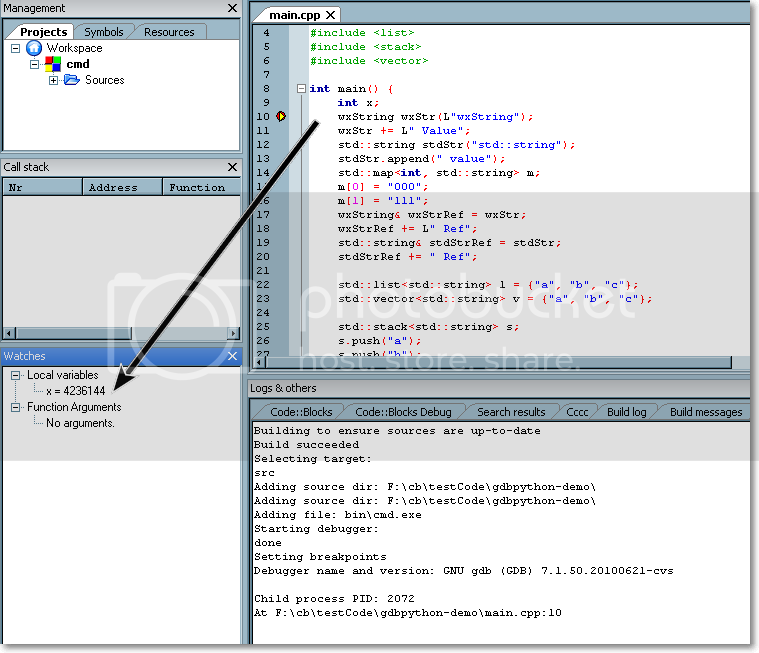 Hi, yesterday, I have found a new way to support the gdb debugging in cb. Here is the brief introduction. Then, I suggest that you don't need the gdb.script to register several types, so, it is saft to comment them, because python scirpt works better!!! That's all, you can enjoying debugging!!! You can add the variable SS to watch window, and see how good it works. and it works really badly if python gdb scirpt is not enabled. there is only one problems when using the python script for wxStuff and stl. When we are using "info local" command to let the gdb show all the local variables, we may meet some problem. 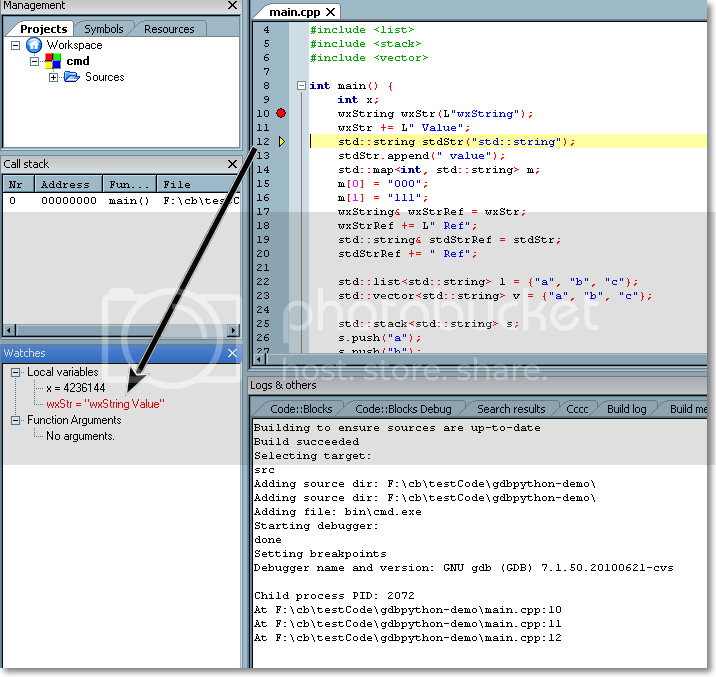 If you set a breakpoint in the first line "int x", then, you have "info local" enabled in your debugger setting dialog. You will get the gdb crashed, or python will generate many Errors. that's because, at this moment, all the local variables were not initialized. I'm not sure how to solve this kind of problem, is it related to GCC? GDB? or only python script? As it seems there are some problems in the pretty printers in GDB and GCC as far as I know doesn't emit debug info for the status of the variable (initialized/non initialized). How does gdb know some local variables are already initialized or not? Maybe, the GCC can add some extra instructions after a local variable initialization. Then, GDB can check these debug information generated by GCC, then every thing will be OK.
Also, I have found another way, that is something like" lazy show watches", that is to say: if a variable would like to be shown in the watch window for the first time, then it will be delayed after some children of this variable is changes. Follow this rule, I think we can workaround this issue. Another way is: We need to handle the excpetions in both python and gdb , like if the string length is too long, we should believe the variable is not initialized, so we just print some word like " out of scope" or "not initialized".. Many IDEs like Kdevelopers and Qtcreater may meet this kind of problems either. I'm not sure how they solve them. GCC as far as I know doesn't emit debug info for the status of the variable (initialized/non initialized). At this time, the variables info (initialed or not) should be recorded in somewhere. Because exceptions can happens very where, the exception handler need to call the "destruction of the already initialized object". ollydbg: you should read about the dwarf (the debug info format), I'm too lazy to read it myself. Thanks, I have search that dwarf standard manual. and found there is a property named "DW_AT_start_scope". But it seems Currently, GCC never generate this kind of debug information. As a conclusion about this issue, I don't think I can help to solve. Because I have no idea about GCC and GDB source. I have solved this problem, I have patch the gdb cvs code, it seems so nice. you can see the screen shot of CB when I'm debugging. I will publish my patch to gdb maillist and gdb bug site. I forget to mention, Loaden has helped me a lot, especially to cross-build gdb on linux. Thanks loaden, and also other Chinese guys.